Though it may strike you as a dry country, there are many amazing lakes in Kenya. Sure, Kenya is the place to go for the endless grassland plains, safari wildlife and mountain trekking, but don't forget the lakes in Kenya for some beautiful scenery. Heading to the west border of Kenya, you'll find huge Lake Victoria. With over 68,000 square kilometres, it’s the largest lake of Africa and the second largest worldwide. The famous Nile river has its start here. The lake has 3,000 islands and many of them are inhabited. This is the lake to visit for if fishing is your game, because Lake Victoria is famous for its schools of big Nile perch. 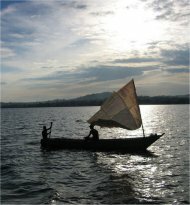 The town of Kisumu is right on the lake shore, and accessible from Nairobi on a main road, by car or bus. The small Ruma National Park is right there, and gives you a chance to see some more wildlife, away from the busier major parks. Lake Turkana is the largest desert lake in the world, with a length of about 250 kilometers. The water at Lake Turkana is bright, giving it the nickname "the Jade Sea". I can't even describe how it looks against the brown of the surrounding desert. The lake is home to thousands of native birds, hippos and crocodiles. For all its size and beauty, Turkana is one of the most remote lakes in Kenya, and surrounded by harsh terrain in the north of Kenya. From Nairobi, you'll be on the road for at least 2 days before getting there. Sure you could fly, but what fun is that? There aren't many decent roads around Turkana, so you really should visit this lake with the help of a proper tour guide. This soda lake lies to the south of the city of Nakuru, which is 160 kilometers north of Nairobi. Nakuru means “dusty place” in Maasai language. The lake is best known for it’s huge population of pink flamingos – up to 2 million of birds who cover the lake’s surface in pink. Due to natural conditions, the lake shrunk considerably in the 1990s from 45 to only 5 square kilometers, but meanwhile it has largely recovered. 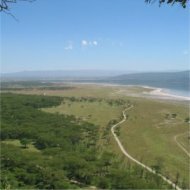 In 1961, Lake Nakuru National Park was established around the lake. Among the wildlife in this park are Rothschild giraffes, black rhinos, waterbuck, lions and increasingly leopards. Another one of the lakes in Kenya towards the northern end of the country, Lake Bogoria (34 square kilometres) offers something a bit more exciting than just another lake. Besides the huge flocks of pink flamingo, this volcanic lake is ringed with geysers and other bubbling hot springs. You should visit Lake Bogoria with an organized tour because of the road conditions. Seeing the local zebra and baboons would also make the trip worthwhile. Lake Naivasha is a 139 square kilometre lake near the town of Naivasha, north west of Nairobi. It’s name is derived from “nai’posha” in the Maasai language, meaning “rough water” because of the storms that occur here. Besides the sizeable hippo population, the lake is especially known for it’s large collection of birds: over 400 species. The famous author Joy Adamson lived at the lake in the 1960s. Locals fish in the lake, and farmers grow flowers in the area surrounding the lake. You can't forget Lake Magadi, in the southern end of the country. If you're touring though the land of the Masai warriors near the border with Tanzania, try to see this lake while you are there. I doubt you've seen anything like it. The waters are alkaline, and there are salt flats surround the entire lake. The white salt reflects the sun, making the land baking hot. So you won't see any wildlife lingering around the shored, but the birds and flamingos are plentiful. There is a direct road to Magadi from Nairobi, and you could even take a bus. So when you are planning your next trip to Africa, don't forget making some time to visit the lakes in Kenya. Besides offering some relief from the dusty plains, they can give you a whole new view of Kenyan wildlife.